Pollokshields Conservation Area in Glasgow is well regarded as a particularly fine example of the “garden suburb” vision, sporting numerous bespoke villas. Lawlor House, the newest addition to their number from Gareth Hoskins Architects, promises to continue this tradition of excellence. Occupying a former orchard on a steeply sloping site the home is bounded on three sides by mature trees in existing gardens with a wooded public park dropping away from the western boundary. 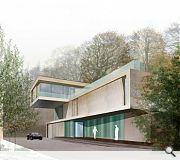 The dwelling is a contemporary interpretation of the ‘Grand Villa’ with sliding panels of buff sandstone, render and glass contained within a folding precast concrete band. Accommodation is split over three levels with rooftop terraces maximising outdoor spaces and views, culminating in a dramatic prow of living space abutting the road. 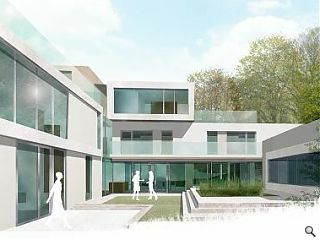 To avoid ‘overlooking’, accommodation has been arranged around private courtyard gardens that terrace down to the front entrance in response to the site slope. The line of the boundary wall is continued into the main body of the building with a frameless glass wall, to form a covered entrance visible from the street. Cantilevered timber staircases and a glazed lift maximise light in the double height reception area whilst providing access to first and second floor bedroom suites. 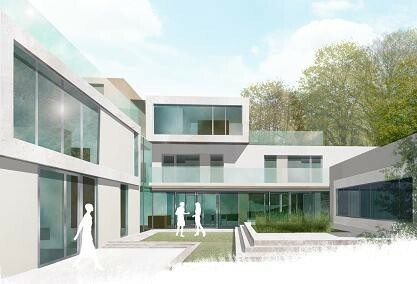 The master bedroom on the third floor is cantilevered over the entrance / drive to maximize the benefit of sunlight & views, and opens onto a south facing roof terrace. As well as six bedrooms with en suites and dressing rooms, accommodation including a fitness suite with pool, gym, sauna and steam room, a fully glazed family living / dining area and entertainment suite. 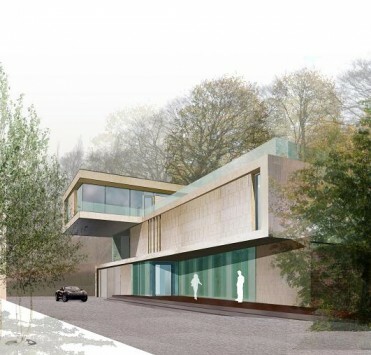 The proposal has received planning approval and will start on site mid 2009.